Year ’round there are special happenings throughout St. Augustine’s Old City and the surrounding area. Naturally, historical events abound, from special archaeological digs to an annual Colonial Night Watch re-enactment and procession. Over the last 450 years, many cultures have enriched this area with their heritage, such as Spanish, British, French, African, Minorcan, Seminole, Irish, Scotch and others. Festivals, gatherings, food fairs, entertainment, and other events celebrate this melting pot. Our natural beauty and seaside semi-tropical location also give reason to celebrate with seafood festivals, flower and garden expos, nesting wild heron and egret viewings, boat parades and other special happenings. Visual, musical, literary, and performing artists – from local to international fame – share their talents in exhibits, concerts, live performances, theatre productions, classes, demonstrations, jams, recitals, dances, and other venues. Major sporting events in golf, tennis, football, and motor sports are held nearby, and athletes join local fun and competitive runs, races, ball games, fishing competitions and more. Holidays fill the calendar with fun, from parades to inn tours, from fireworks to millions of white lights, from spooky cruises to egg decorating! Get hands-on, pulling a net through a lake to learn about its inhabitants, joining a guided beach walk to learn about shells, beach critters, and coquina, or competing in a one-day photo challenge. Tour a historic cemetery, watch the full moon rise over the ocean, or celebrate the all-American hamburger! In an area so rich with activity, the options are endless and events are ever-changing, with something for all ages. 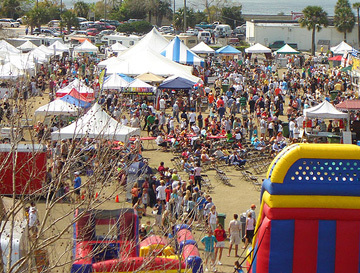 There are fabulous annual recurring events in the St. Augustine area, some celebrating over 50 years! Many of these events are free, some charge admission, some charge parking fees. Here are some of our favorites, with brief descriptions. See what’s happening during your visit! Check linked websites for specific dates and more details. Handcrafted original work displayed and for sale by the artists and craftsmen at this 2-day outdoor event. A “laid-back” venue, featuring jewelry, stained glass, ceramics, photography, handcrafted soaps, and more; all made in the USA! Fresh food and more. Held at St. Johns County Pier, 350 A1A Beach Blvd, St. Augustine, FL. A weekend festival, with midway amusement rides, slides, silent auction, bingo, fair food vendors, live local musical entertainment, fireworks, famous fried shrimp dinner, super cash raffle. 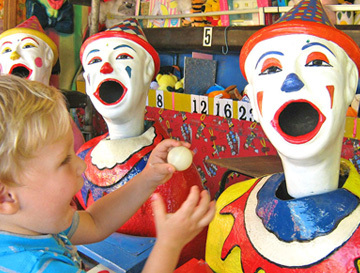 Activity and fun for all ages. Located at Prince of Peace Church Grounds, off San Marco Avenue near the Giant Cross. Day-long recreation of the experience of hundreds of slaves who traveled to Fort Mose, the first legally sanctioned free black community in the USA. 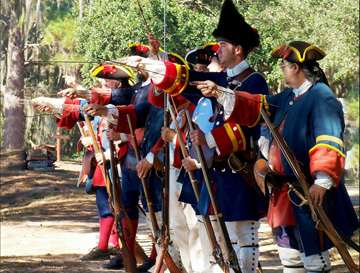 Re-enactments and guided trail tour. Located at 15 Fort Mose Trail, St. Augustine, FL. A Saturday event, presenting the best and hottest Southern-style food from area restaurants and retailers, plus a variety of local and regional craft beers to go with the food. Live music, shows, wagon rides, farm tours, kids’ zone. Bring lawn chairs. Presented by the Florida Agricultural Museum and benefits Museum projects and the Feed Flagler Initiative. Held at Florida Agricultural Museum, 7900 Old Kings Rd., Palm Coast, FL. Held from 4pm-8:30pm, a 5K run followed by open-house exploration of the Lighthouse. Located at St. Augustine Lighthouse and Maritime Museum, 81 Lighthouse Avenue, St. Augustine, FL. 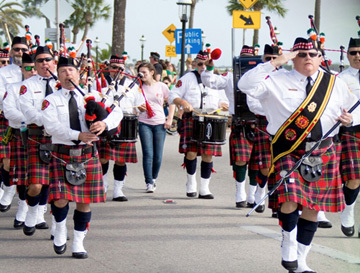 St. Augustine is honored to present the only St. Patrick’s Day parade in Northeast Florida. Watch as the kilted marching bands of pipes, drums and bagpipes travel the streets of the Old City. The parade flows into to Francis Field, for the Celtic Music and Heritage Festival. Wear your green (or your tartan) and come out to the parade! Parade begins at 10am on Orange Street. 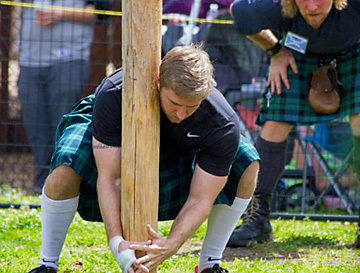 Celebrate the area’s Celtic heritage! This weekend festival presents Celtic musicians ranging from traditional ballads to Celtic rock, Highland Games competitions, booths of Clans sharing their families’ heritage, special performances, St. Patrick’s Day parade through downtown St. Augustine, a parade of clans, Celtic merchandise, Celtic food and spirits, and local cuisine. There’s a Whiskey Tasting Event too. Held at Francis Events Field, 25 W. Castillo Dr., St. Augustine FL. Featuring delicious seafood, with crab, shrimp, fish and more. Gyros, pizza and Asian food too. Arts & Crafts Village with pottery, artwork, jewelry, and housewares from over 100 artists. Live music with a different style featured each of the 3 festival days. Rides, Kidz Zone, and family activities. Held at Francis Field at 25 W. Castillo Dr., St. Augustine, FL. Proceeds benefit St. Augustine Lions Club. High quality art from real working artists from northeast Florida and all around the US. These shows present nearly 125 juried fine artists and craftspeople, and pride themselves on showcasing genuine and unique works of art, no imported productions or manufactured items. The artists are chosen to provide a well-rounded selection, including jewelry, decorative and functional pottery, sculpture, glasswork, hand-woven fashions, photography, paintings, wood carvings, mixed media and more. Come meet and support the artists. Held at Francis Events Field, 25 W. Castillo Dr., St. Augustine FL. Call (904) 824-9725 for more information. Call (904) 315-7414 for more information. A 3-day weekend of award-winning regional and national BBQ champions, people’s BBQ choice awards, continuous exceptional live music, arts & crafts, bungy jumping, children’s games and rides, vendors. 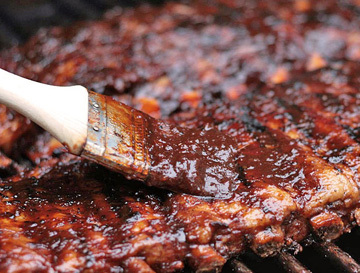 Local chefs compete for the best BBQ. VIsitors are welcome to bring blankets and lawn chairs. This is the signature fundraiser of the St. Augustine Sunrise Rotary Club, with proceeds donated to charitable organizations and service oriented projects. Held at Francis Events Field, 29 W. Castillo Dr., St. Augustine FL. 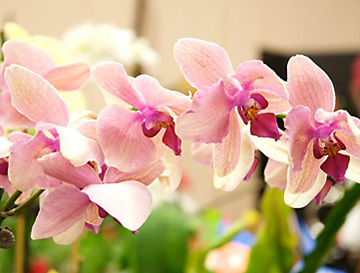 A weekend event presenting growers, nurseries and artisans with vibrant plants, trees, flowers, and garden art. See olive trees, aquatic plants, herbs, ferns, succulents, citrus, flowers, native plants and more. Select garden accessories and art for your landscape. Learn how to restart and enhance your gardens. Lectures, door prizes, quilt show, Expo brunch, children’s activity area, food and beverages. Major fundraising event for EPIC Community Services for substance abuse and mental health services. Held at 3125 Agricultural Center Dr., 32092. A 5-day fest, where world-class wildlife and nature photographers, experts, and instructors come together to offer technical training opportunities and in-field birding programs for beginner to advanced photographers. Sign up for workshops, classes, seminars, and field studies. Take boating excursions and ecotours at different times of day/night and in many locations, as well as kayaking tours, and walking tours. Photo contests, renowned speakers. Fest is timed to coordinate with nesting season for wading birds. 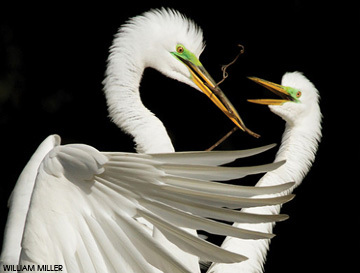 Exhibitors and vendors showcase the love of birds, nature, and photography. Headquartered just 10 minutes from downtown St. Augustine at the GTM Research Reserve, 505 Guana River Rd, Ponte Vedra Beach, FL, with events at various other locations during the Fest. A Saturday event, where the culinary heritage of St. Augustine is showcased. From casual to upscale, cuisine from new and established area restaurants is presented, along with information about the area’s food culture, local food sources, food preparation, and local food trends. Local brewery and wine offerings, People’s Choice Award, live local bands, children’s area. 5K “Race to the Taste”. Proceeds benefit EPIC Behavioral Healthcare. Held at St. Augustine Amphitheatre, 1340C A1A South, St. Augustine, FL. A Saturday evening fundraising event, featuring dinner served in the exotic setting of the Alligator Farm. Enjoy BBQ chicken, coleslaw, BBQ baked beans, dessert, roll, iced tea. Beer and wine available, vegetarian meal offered. Video show, live music. Dinner ticket includes all-day pass to the St. Augustine Alligator Farm. H.A.W.K.E. is a non-profit organization licensed by the State of Florida and the Federal US Fish and Wildlife Service to rehabilitate injured and orphaned wild birds, mammals, and reptiles including endangered species. They also have special permits to possess permanent wildlife for educational programs. Held at the St. Augustine Alligator Farm Zoological Park, open exclusively for ticket holders from 5-9pm. Location: 999 Anastasia Blvd, Saint Augustine, FL. Gamble Rogers was a local acoustic-Americana recording artist, guitar finger-picker, songwriter, dynamic live performer, narrator, commentator, author, playwright, and storyteller. He died tragically in 1991 while trying to save a drowning swimmer. He first gained national attention as a member of the Serendipity Singers. As a solo performer, he toured the US and Canada, with multiple tv appearances. The 3-day Music Festival in May features national, regional, and local musicians and storytellers in tribute to Gamble Rogers, presented on six stages at St. Augustine Amphitheatre, 1340C A1A South, St. Augustine, FL. 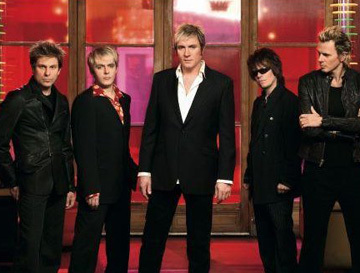 The ongoing Concert Series performances are held at Lohman Auditorium at Marineland, 9505 Ocean Shore Blvd. St. Augustine, FL. Spectacular fireworks display over the St. Augustine bayfront. For more information on this event please call (904) 825-1004. 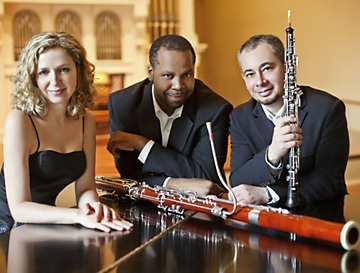 Acclaimed concert program including an evening series of six performances, and afternoon series of four performances, two holiday Pops concerts, and one free community concert every season. Performances include bands, ballet, regional and international symphony orchestras, ensembles, chamber music, solo musicians, singers, pops concerts. Four Words and Music concerts are held in the main building of Flagler College and EMMA also brings concerts to local schools. Held in the Lewis Auditorium of Flagler College, 14 Granada St., St. Augustine FL. 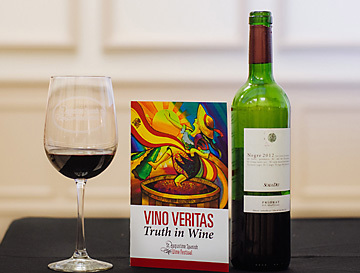 St. Augustine’s Spanish heritage is celebrated with sumptuous food and 125+ delicious wines, Spanish music and dancing, and a European experience, held in various locations. Five events over four days, including luncheon, dinner, reception, tapas, grand tasting, and wine-fight team competitions. Proceeds to benefit local charities. Opa! A 3-day weekend event to celebrate all things Greek. Features homemade Greek foods, colorful Greek dance and traditional live Hellenic music, outdoor authentic Agora market of imported Greek items, kids’ center with rides and games. Kafenio serving Greek coffee and cafe treats, mouth-watering pastries, Taverna with ouzo, Greek lemonade, Greek beer and wine. Bakaliko with imported grocery items from Greece. Vendors of jewelry, arts & crafts and more. Presented by Holy Trinity Greek Orthodox Church. Set in a virtual Greek Village at Francis Field, 25 W. Castillo Dr., St. Augustine FL. Held on the first Sunday of November, 12-4pm. Over 30 of Florida’s best restaurants and chefs present 100+ different chowders. The restaurants donate their chowders and their time (in hope of winning) to help the St. Augustine Shrine Club raise money. Over 2000 gallons of chowder are served, so tasters can vote for their favorites among Minorcan Conch Chowder, Minorcan Clam Chowder, New England Clam Chowder, and Seafood Chowder. Live music. 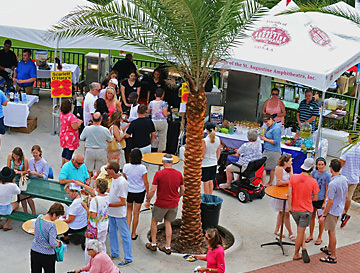 Held outdoors on the waterfront at the Conch House Marina Resort & Restaurant, 57 Comares Ave., St. Augustine FL. A prestigious juried 2-day outdoor art gathering held here for over 50 years. Featuring 150 top juried regional and national fine artists. Handmade of the finest materials and professionally displayed, the arts and crafts include original paintings, pottery, jewelry, woodworks, sculpture, photography, glassware, fiber arts, gourds, baskets, mixed media, and more. A Thanksgiving weekend tradition for visitors, art collectors and holiday shoppers. Artist awards, artist demonstrations, live music and entertainment by local performers, kids’ art zone, historic village with colonial textile artisans demonstrating. Held at Francis Field, 25 W. Castillo Dr., St. Augustine FL. St. Augustine was named by National Geographic in 2011 & 2012 as one of the Top 10 Places in the World to view holiday lights! This area-wide holiday event sets St. Augustine aglow with millions of tiny white lights, creating a magical atmosphere in the nation’s oldest city. The spectacular lighting celebrates the Spanish tradition of displaying a white candle in a window during the Christmas holidays. Tour the Nights of Lights on foot, by bicycle or pedicab, on the Old Town Trolley or Ripley’s Red Train, biplane tour, Schooner Freedom bayfront tour, guided walking tour, or by horse and carriage. Many special holiday events are held in conjunction with Nights of Lights, all around St. Augustine and St. Augustine Beach. On the first Wednesday of December from 7-9pm, the St. Augustine Lighthouse and grounds are open free of charge for children’s holiday craft sales, warm refreshments, live musical performances, and the Museum’s Christmas decor. The Keeper’s House is decorated as it was in the Victorian Era. Santa visits with children and the walking paths and grounds are lit with thousands of luminaries. Located at St. Augustine Lighthouse and Maritime Museum, 81 Lighthouse Avenue, St. Augustine, FL. One of the largest holiday parades in North Florida, including floats, marching bands, cars, horses and the arrival of Santa Claus. Starts at 10am at Mission of Nombre de Dios, continues through historic downtown St. Augustine, and ends behind the Visitors Center on Castillo Drive. For info call 904-824-4997. A self-guided weekend walking tour, beginning at any participating Inn, with certain Inns open for touring on Saturday and others on Sunday. Recognized as a Southeast Tourism Top 20 Event, this is one of the highlights of the holiday season. Visit dozens of St. Augustine’s fine Bed & Breakfast properties to see their holiday decorations inside and out, while enjoying signature dishes and treats from the local culinary partner paired with each Inn. Each year the Inns decorate to a fun and festive pre-set theme. Sponsored by St. Augustine Historic Inns. Proceeds benefit a different charity each year. St. Augustine Beach celebrates from 5-10pm on New Year’s Eve. This fun family event includes a host of kids’ fun, food vendors, beer and wine, live radio broadcast, big screen tv sports, carnival rides, mechanical bull, photo booth, and live entertainment – all highlighted with a fireworks display to music, early enough for all ages to enjoy. Shuttles from nearby parking and free bicycle parking. Held at St. Augustine Beach Pier, 350 A1A Beach Blvd., St. Augustine Beach, FL. High quality art from real working artists from northeast Florida and all around the US. These shows of about 125 juried fine artists and craftspeople pride themselves on showcasing genuine and unique works of art, no imported productions or manufactured items. The artists are selected to provide a well-rounded selection, including jewelry, decorative and functional pottery, sculpture, glasswork, hand-woven fashions, photography, paintings, wood carvings, mixed media, and more. Come meet and support the artists. Held at Francis Events Field, 25 W. Castillo Dr., St. Augustine FL.